Ready to Ride? Why Wait? Many women have a difficult time diving headlong into motorcycle riding. Maybe you've dreamed about buying a bike for years, imagining what it would be like to jump on the bike each weekend and go riding wherever the wind takes you. Or maybe you see, riding a motorcycle as a step to take, to reduce your carbon footprint. What's stopping you from taking that step and buying that bike? For most women, there are lots of reasons not to buy a bike and only one reason to buy one. That one reason, trumps all the reasons not to - you ride motorcycles because you want to. Thousands of women talk themselves out of buying a motorcycle, every day. For many women, the reason not to ride is simply one of responsibility. Most women have too many responsibilities to simply jump on a motorcycle on the weekend and take off for a few hours - much less a few days! Who would take the kids to soccer practice? Who would catch up on the laundry? Plan the meals? Buy the supplies for the school project? The list of responsibilities goes on and on. Buying a motorcycle and learning about the sport would take precious time and energy away from real responsibilities. Not only will having a motorcycle make you a bad mother, it will make you a bad spouse. Many women begin their motorcycling experience on the back of a big, usually their partner's bike. There's no knocking the fact that riding on the back of a motorcycle is a lot of fun and a great way to spend time together. Women often get stuck on that idea and never get beyond it. They feel that venturing out on their own bike could change the dynamics and create tension where there might not have been any before. Women sometimes lack the confidence to get on a bike by themselves. Some women find that it's easier to get into motorcycle riding through scooter riding. Buying a 50cc scooter is a great way to get out on the road on a bike that's easy to handle. Riding a scooter makes good economic sense. A scooter is relatively inexpensive and it gets great gas mileage. Riding a scooter around town can get over one hundred miles per gallon! You don't need a motorcycle license to ride a scooter. Once you find your comfort level on a scooter, you can look to upgrading to a motorcycle. Many women find that taking a motorcycle class is a good way to become familiar with the mechanics of motorcycle riding. 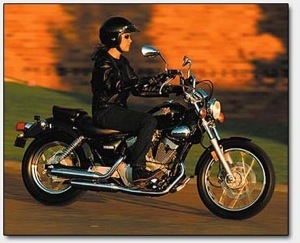 Taking a class can give a woman the knowledge base to feel more comfortable driving a motorcycle. A good motorcycle class can really empower a woman and give her the confidence to take up motorcycle riding with enthusiasm. It's easy to talk yourself out of buying a motorcycle and realizing your dreams, if you stick with the same thought patterns that have been governing you for years. There are more than a few reasons to talk yourself out of entering into the sport of motorcycle riding, but it's easy to make excuses to yourself about why you shouldn't try it. What's hard is making the leap necessary, to decide you're going to follow your dreams and try motorcycle riding. All those reasons not to ride? Those don't stand up to the one essential positive idea about motorcycle riding. Women should ride motorcycles because they want to. If they really want to, they'll find a way to learn about the bikes. They'll find a way to get someone to watch the kids while they take a motorcycle class. They'll find the confidence to learn to ride on their own. If you want to learn to ride a motorcycle, you should go for it!